Towards the end of the day, we cross the Amargosa River and go over a small mountain range between highway 127 and 178. The Amargosa River is almost 300 km long. It drains the high desert northwest of Las Vegas, then flows south into the Mojave Desert, and finally makes a sharp turn north again into Death Valley where it disappears in Badwater. Except, it is not a typical river because most of the water is underground. The Amargosa only flows above ground for short stretches in the Amargosa Canyon and near Beatty. I presume what we cross what normally is a dry wash (the real water is underground), and only has water because of recent rainstorms. And soon the next big mountain range comes into view. The snow capped mountain is Charleston Peak, almost 12000 feet high. Las Vegas is in the valley behind it.We will cross a bit further south through Red Rock Canyon the next day. Nopah Range in the front, Pahrump in the valley behind it, and Charleston Peak in the distance. Day 2 was the longest distance, about 150 miles, on this trip. The toughest section was from the geologist cabin to the center of death valley. Not because it is any technical challenge, but because it is a long rocky road that we rode at higher speed. Albert called it "bone-jarring". I also felt pretty beaten up at the end of the day and enjoyed the hot tub in Tecopa Hot Springs more than I usually would. We had to alter the planned route to avoid battling with mud (as I did last month in the Mojave as you saw on the earlier post, that was enough). Around Tecopa Hot Springs (and at the moment also Death Valley), the Amargosa River feeds flood plains. Dry and hard pack most of the year, but not now. Tecopa Hot Springs had live music, a slightly shaky band playing classic rock/pop tunes. My room had direct access to a hot tub. After dinner, I was getting cold again, my joints were still hurting, and the band was getting on my nerves. The drummer missed the beat when he did a roll on his toms and the mandolin player had an out-of-tune pair of A strings. Sitting in the hot tub with the water coming in cut those sounds enough to make the music even enjoyable. OldPete, Square1 and Marcus I. like this. A cold and gloomy day. We even got snow in the afternoon going over the pass into Red Rock Canyon. The first miles are near Kingston Peak and give a view into the valley with the Dumont Dunes, the town of Baker would be to the left/south and Death Valley to the right/north. With low hanging clouds, the photo fails to convey the impressive view. Then we had a long sandy stretch to the appropriately named village Sandy Valley. I was happily moving at around 30mph in the deep sand. The handlebars wobble a bit, but it also isn't too fast to get nerve wrecking. I was definitely riding in my happy spot. The others went ahead a bit faster. A taco stand was parked in front of the Trails End General Store where a teenage girl took orders on her spiral bound notebook in English and Spanish and then conveyed them (in Spanish) to an older man next to her who assembled them. We now were in Nevada and she confirmed "Yes California is not far from here". She took her job seriously and would be a conscientious restaurant manager. According to Google Earth, California was about 1400 meters from the Taco stand. John took his helmet off and barked out in frustration: "Roland, WHAT are you doing? I can't ride THAT SLOW in the sand!" Clearly exasperated, he pointed out that in his world the minimum speed limit to ride in deep sand is 40 mph. He was struggling how to explain such an obvious fact. "Have you ever waterskied?" No. "Well, you can't waterski slow either". I told him that 30mph was about as fast as I felt comfortable there. Any faster, and I wasn't confident I would see or recognize obstacles. But he would have none of that: "And if we go that slow, it is like being at Disneyland and doing teacups all the time and never get to ride the Matterhorn". Disney teacups were a recurrent theme, I got the distinct impression that neither John nor Steve like teacups. I don't have insights about Disney's Matterhorn, but here is the real Matterhorn seen from a hike a few years ago. Not hiking on the Matterhorn itself, which is a very difficult climb. I believe this is the North Face, which wasn't climbed until the 1930s. We're teacupping it. The weather got gloomier and it started to snow a bit, so pictures that usually would be spectacular don't look like much. The very last stretch is the famed Red Rock Canyon. Mostly because it is a really pretty canyon that also sees lots of tourists from the Las Vegas side. 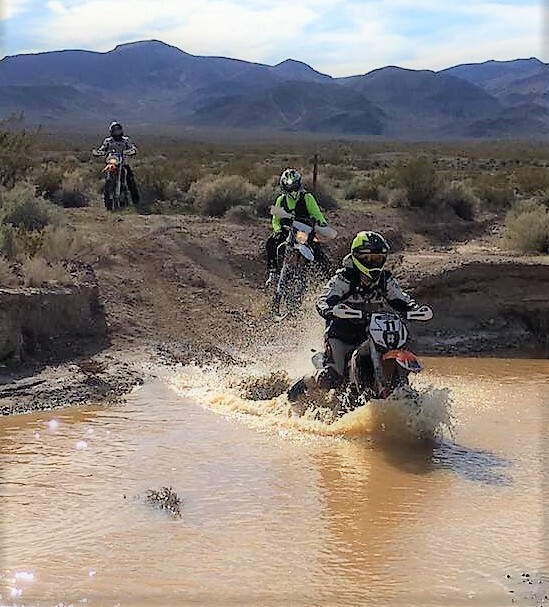 Among offroad motorcyclists, it is apparently also known for the rocky uphill section that gets very congested during the annual LA-Barstow-Vegas ride the day after Thanksgiving. It is a fun section. Too bad it isn't very long, it is already over just when you get the hang of it, maybe just 1/4 mile. The rocky section is sufficiently challenging that I probably would not have tried it by myself on a solo trip and turned around, but it isn't that hard on a small motorcycle or on a bicycle (downhill only, would be pushing this uphill direction). Having seen it, I'd do it on my 225 on a solo trip, but would not do it by myself on a 400+ pound motorcycle. Steve starting the rocky section of the Red Rock Canyon climb. superfunkomatic and eaglescan like this. Really enjoying your report fiddlefestival. I didn't know there was a Husky Memorial out there. I'll have to take my new one for a visit. Thank you for including the history bits too. Looking forward to rest of your report.